I don’t know about your gardens, but the Demo Garden isn’t loving the heat so much. It’s not looking too bad, just a little rough around the edges. The one thing that seems to be thriving in the heat are the melons. They have really grown this week! Still no ripe ones though. The Chocolate Cherry tomatoes and the yellow roma are from the Family of 4 Garden. 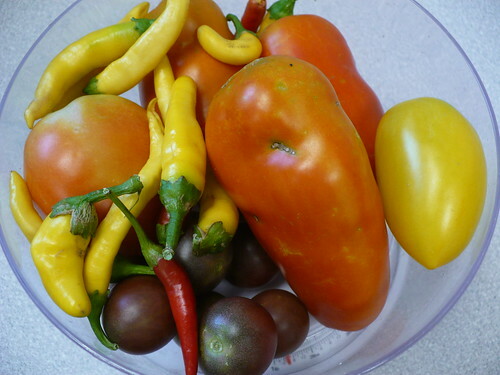 The red romas are from our Early & Late Tomato garden, and the peppers are some cayennes (yellow) and Thai chilis (red). At least we are getting a few tomatoes! 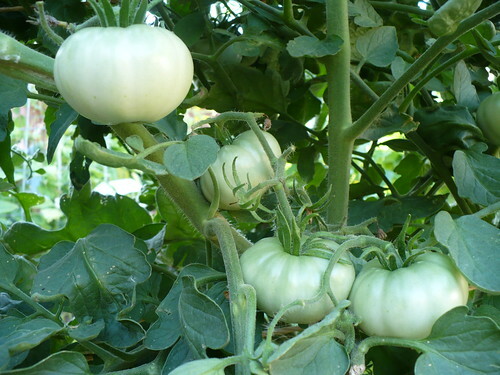 The Marmande tomatoes are definitely going to be the production winner in the heirloom category. Visually, there doesn’t seem to be a significant difference between the grafted and non-grafted heirlooms. 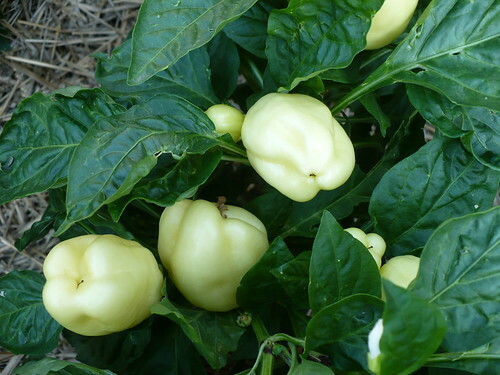 On the other end of the garden, the Albino Bullnose peppers continue to surprise me with how productive they are. Just goes to show, you should judge an heirloom, just because it’s an heirloom! 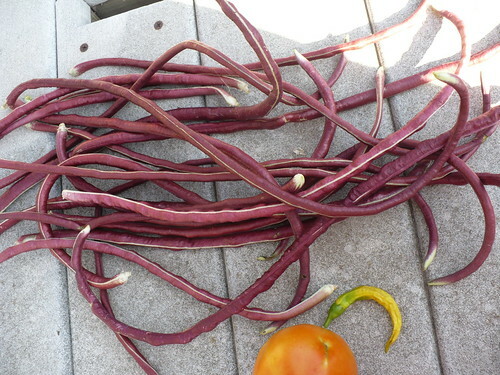 The Chinese Long Beans are kicking in again this year…I guess I’ll have to find a good way to cook them eventually. These are a little oversized, so we just pitched them. 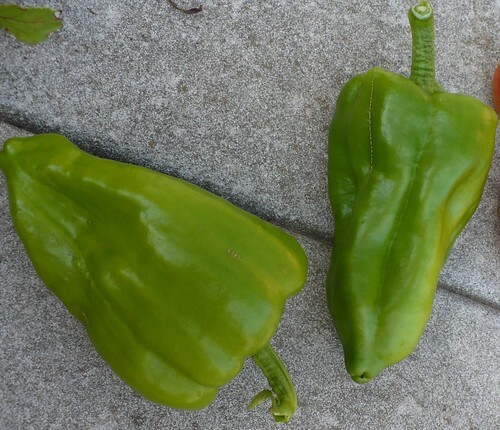 We found these nice bell peppers on one of the plants in the Family of 4 Garden this week. They probably set on very early after planting, because there aren’t a lot more peppers on the plant yet. Posted on July 15, 2011, in Family of 4 Garden, PhotoEssays and tagged beans, peppers, Tomatoes. Bookmark the permalink. Leave a comment.